Training, education, mentoring, and growth are all key attributes that people seek and desire in so many areas of life and their careers. It is the sense of being poured into and making steps toward progress. Motivation is found in having people who care about your long term success and not just an immediate impact. At Peach State Roofing, it is common culture of building a team of competent commercial roofing professionals who are well rounded and well versed in the world of flat or low sloped roofed systems as well as many other types of commercial roofing and waterproofing practices. 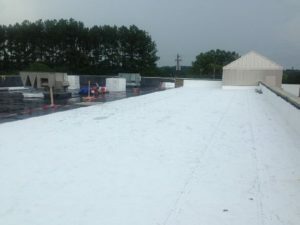 Whether dealing with TPO, EPDM, PVC, Fibertite, modified bitumen, built up roofs, roof coatings, repair work, waterproofing, asphalt shingles, metal panels and beyond, Peach State Roofing strives to take time and educate it’s employees on anything and everything that it may encounter in the commercial construction world. Peach State’s view point on experience or education is that the process of growth and knowledge is something that cannot be rushed. As many other contractor’s in the commercial roofing world seek to just ‘fill a spot’, it’s Peach State Roofing’s belief that a long slow track of continual field experience and constant mentoring by older industry professionals is not only key but truly a requirement to be successful in the long term time frame of a career. Something that has becoming very well known among contractors, manufacturer’s and other industry professionals in the commercial roofing world is the long term training and education of personnel at Peach State Roofing nationally. To many who come to PSR it is explained as training and learning the roofing industry the ‘Peach State Way’. It’s often explained to new hires coming into the roofing industry that Peach State fully expects a good three years of being hands on in the industry before that person can truly understand and ‘run fully’ at their craft in the roofing industry. Yes, all hires bring tremendous value and skill that is of great use to Peach State Roofing right from the start but management tries to make employees understand that they do not want to rush their growth and teach them what is believed to be the ‘right way’. Even as industry professionals come on board around the country with certain levels of roofing and waterproofing experience, PSR encourages all employees to in a way, forget what they know and come in with a fresh mind and attitude of learning everything new. Typically the ideal path for people coming into the roofing industry is one in which Peach State Roofing encourages professionals to very simply work on the roofs. What better way to learn the commercial roofing industry than to learn how to install it hands on. It is explained that the notion of working on the roods is not a long term position but a stepping stone in the right direction. Whether it is a college graduate or a seasoned professional, when an employee is willing to work on the roofs for 3-6 months acting as a site superintendent, repair technician, assistant project manager, warehouse sheet metal fabricator, or quite simply a general roof or metal laborer, the level of success when that employee comes of the roofs to work and train in the proper long term position is incredibly higher than employees who did not take that ‘field experience’ type path. Quite simply, you will hear management at Peach State Roofing tell others that the longer personnel can work on the ‘flat roofs’, the better they will be down the road. The experience of learning in the field is hard work for both the employee and the employer but PSR feels its the best way. There is a very hands on daily interaction and approach from upper management with its employees that comes from the top personnel literally knowing how to roof and vast years of installation experience from the founding days of the company. The founding personnel of Peach State Roofing literally have thousands and thousands of hours of installing commercial roof systems of all types on their own, especially in the early years of the company. Most people in the roofing industry know the reputation that the upper management of Peach State Roofing are some of the best roof installers in the company. It is not rare for key personnel to go to job sites to literally install roof fasteners, insulation board, or heat weld membrane side by side with the crews in an effort to teach them the quality that Peach State Roofing expects. Peach State Roofing teaches new employees for sales, project management, and many other career paths how to run a commercial roofing crew, install polyiso roofing insulation and other types of cover boards, use a screw gun to install roof insulation, how to use a heat gun and weld different types of membrane roof systems, how to fabricate and install metal details and so much more. PSR works to bounce trainees around to all sorts of different roof systems such as TPO to a PVC system to an EPDM system to a roof coating and beyond. There is the desire to have our personnel well rounded and well versed. Different manufacturer’s such as Johns Manville, Firestone, Carlisle, Versico, Fibertite, and GAF are all different variations of roofing systems that personnel are placed on to become well versed with the different roofing manufacturer’s and their warranty installation requirements. Quite simply, field roofing experience is highly thought of at Peach State Roofing. When employees come ‘off of the roofs’ and into their long term career paths – continual education is always a main practice. Plant tours at manufacturer’s locations such as Fibertite, Johns Manville, and Carlisle all have been used as great education tools. Roof system manufacturer’s from rep firms such as Versico, Firestone and beyond are brought in regularly to many of PSR’s national offices for industry updates, lunch and learns, and on-going education for our reps. Tradeshow visits in the commercial roofing industry and construction industry overall are used to walk teams of Peach State Roofing employees around to learn directly from many product manufacturer’s and service providers with what is ‘new’ in the commercial construction world. Very easily stated, the process of continual roofing industry training is extensive, on going, and very valued at Peach State Roofing. The list and story of training employee’s the ‘Peach State Way’ can go on and on but it is a hope that many in the commercial / flat roofing world and real estate industry come to understand that Peach State Roofing professionals are some of the most well rounded and knowledgeable professionals in the industry. Ask around other companies and roofing systems manufacturer’s such as Johns Manville, Carlisle, and Firestone and many will tell you that long term employees at Peach State Roofing truly have great commercial roofing knowledge and are highly sought after professionals across the entire country. It will remain Peach State Roofing’s common practice to always seek willing professionals to have ‘teach-ability’ and a desire to grow so that trusted commercial roofing industry professionals are brought up and highly successful for years to come.